Dubai, UAE, December 21, 2017: For over half a decade, Sally Hansen has been at the pioneering edge of beauty and established itself as a true innovator in nail care. Through a simple philosophy of quality, practicality and affordability, Sally Hansen is the number one nail care brand in the USA. The brand is celebrated for its range of inventive products. 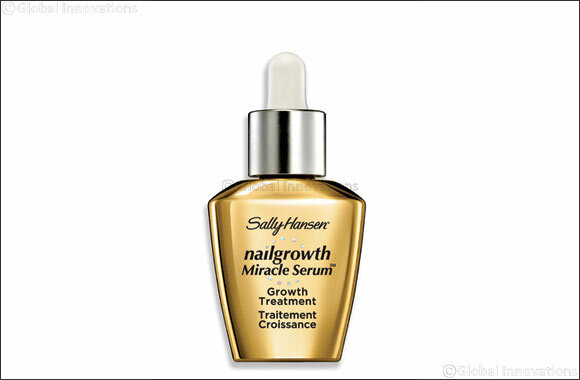 Sally Hansen Nailgrowth® Miracle Serum is a revolutionary treatment which answers to the growing demand from women around the world for more effective beauty treatments. THINK: 59% Longer Nails! * Instantly smooth cuticles. Guaranteed! It’s Gold!. You’ve looked to the beauty authority, Sally Hansen, for salon-quality nails solutions for years. With Nailgrowth® Miracle Serum, brittle, splitting nails and dry cuticles can be a thing of the past. Apply one drop over nail color or worn alone, with cutting-edge treatment nails are visibly stronger and healthier. Formulated with Advanced Peptides and Biotin Technology, this active complex enhances natural nail growth, for nails that are 59% longer in just two weeks. The innovative serum instantly softens and smooths cuticles, while helping nails resist dryness and damage as they grow. The result? Measurably longer nails and soft, flawless looking cuticles.